Wedding PR: Travel Channel, Bridal Guide, Catersource and more! Happy December everyone! Can you believe it is full on holiday season? Crazy! We are rounding up some recent client features this week including Travel Channel, Bridal Guide, Catersource and so many more. See it all below. 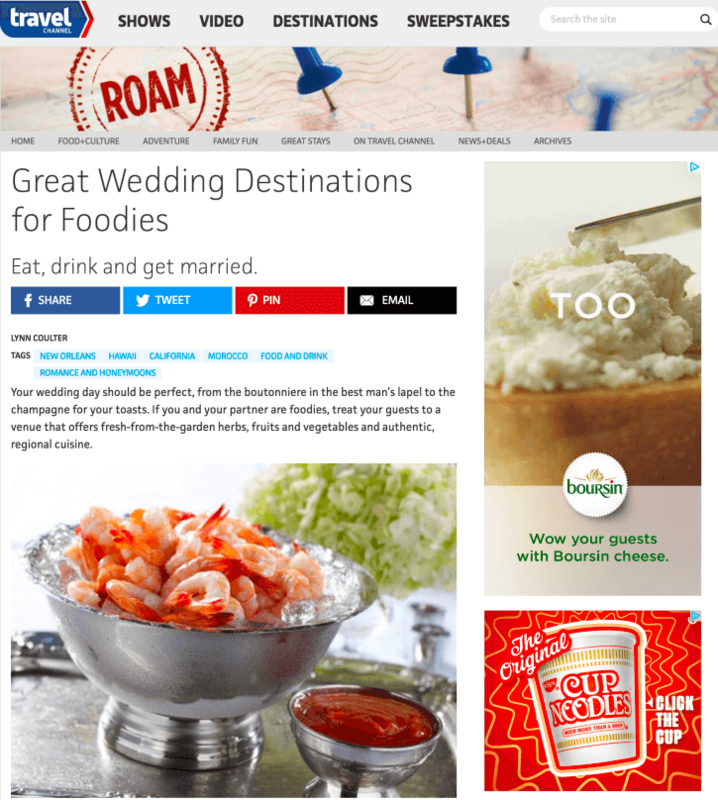 Belladeux Event Design, Destination Weddings, Rochelle Cheever Photography, Cocoon Event Management Group, Wente Vineyards, and Awesomesauce Photography were featured on Travel Channel in the article Great Wedding Destinations for Foodies. See the full feature here. Taylor’d Events Group was featured on WeddingWire EDU in her guest article Taking Full Advantage of the Off-Season. See the full article here. LadyMarry, Belladeux Event Design, Passport to Joy, and Historic Mankin Mansion were featured on Bridal Guide in the article Wedding Day Timing Dos and Don’ts. See the full feature here. 100 Candles was featured on WeddingIQ with their guest article The Art of Inspiration: How to Market Your Brand Through Styled Shoots. See the full article here. Taylor’d Events Group was featured on Catersource with the guest article Cancelled Events: What Do I Do Next? See the full article here. Stephanie Yonce Photography was featured on Hill City Bride in the article 4 Ways to Destress Before Your Wedding. See the full feature here. Kaysha Weiner Photographer was featured on California Wedding Day with the real wedding Dawn & Kevin: Outdoor Beauty at Lake Oak Meadows. See the full feature here. OFD Consulting was featured on Catersource with the guest article Your Off-Season To-Do List. See the full article here.